I am just filled with joy for what he's gotten to experience! With all the pictures and videos that we've gotten, it kind of feels like we were able to be there with him. Not physically of course, but in spirit. I'm so grateful to be a Green Day fan right now and know that Billie is truly one of the most genuine, good hearted, and incredible people in the world. He has the ability to connect with an entire city, who loves him and which he loves back. Not only that, but it's the city of his heritage and both sides are proud that that's the case. That's really amazing. There was probably 50-100 people actually following him around on this trip, and professional cameras as well as people’s phones. So you would be watching something that he knew was very public, if that helps. 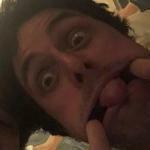 Billie Joe Armstrong yesterday at the Ristorante Marina Grande of Amalfi. As he writes Amalfi News the American singer arrived in Naples on Saturday's day to visit then viggiano, a small country of three thousand inhabitants in the province of power, town of origin of his greats. After visiting viggiano the green day frontman then decided to spend a few hours of vacation even on the amalfi coast which, in these days of late June, saw many vips coming. Together they talked a little about California considering they live near San Francisco. Yeah like it would be different if people were creeping around after him just doing normal sightseeing on holiday, but this was somewhat different. It was a public ceremony with him being awarded the honorary citizenship and him being shown around the town with the mayor and everything. It's not just random fans after him, it's a welcoming party to the town his family's from. All just looks like a very warm welcome to me, nothing intrusive. I didn't realise it was going to be such a big official event, didn't think we'd even need a thread for it at first . Looks like the people of the town made it really special. I didn't realise it was going to be such a big official event, didn't think we'd even need a thread for it at first . I love Adie caption. She seems to have enjoyed the trip as much as Billie. Looks like he and Adrienne had a lovely time, both their captions about it are really sweet. About 4:40 in Billie talks about how he and Joey started researching his family history. Those first 3 videos mostly recap Billie's trip to Viggiano, but they show a bit of new images we didn't see yet. The girl also wrote an article. Nothing new, except the part about the visit of the cathedral. Billie asked to spend some time alone there and in silence. Omg the awkward singing in the BOBD harps video, bless him. It looks as if they left Italy today (video from the Naples airport). I don’t see anyone schlepping a harp I’m guessing he shipped it. Wouldn't that be an interesting sight at the check-in counter. Attendant: "Sir, what is that?" I’m picturing Billie carrying the harp while 80 is stuck with all their bags, haha. God I can’t even imagine what it cost to ship that thing but seems like it was a smart move. The international shipping has to be ridiculous. A small box from the US to English is like $20 USD. I’m guessing hundreds maybe even $1,000. He probably isn’t paying for it though, since it was a gift.